A South Yorkshire gang, whose criminal tax evasion enterprise was based at a warehouse in Rotherham, have been jailed for a total of 19 years. The four men, who came from Doncaster and Rotherham, used duplicated paperwork to bring truckloads of beer into the country from France, Belgium and Germany in a scam known as diversion fraud. An investigation by HM Revenue and Customs (HMRC) found the gang sold the illegally imported goods for cash on a "no VAT, no invoice" basis to small off licences and other retailers across Yorkshire and Lincolnshire, predominantly in Doncaster, Hull and Scunthorpe. Ringleader Huseyin Zerze, of Lonsdale Avenue, Doncaster,used a sandwich shop as a front to hide his criminal scheme transforming it from making £30,000-a-year to spending around £1.5m on alcohol in five months. The goods were purchased by the gang before being imported into the UK via a bonded warehouse in Germany, where alcohol can be stored without paying duty. Large volumes of household branded beer, including Budweiser, Carlsberg and Stella, were illegally imported and sold in the UK. According to the import paperwork, the truckloads of duty-suspended beer were destined for UK bonded warehouses based in Haydock, Doncaster and London. However the beer was illegally diverted to the gang's premises and then sold without duty being paid. The gang initially used Expo Cash & Carry Ltd, owned by Zerze, to run the fraud from premises in Doncaster, Liverpool and Roydon. The business closed down in June 2013 after HMRC started looking into the company. Zerze and his right hand man, Ozgur Kaplan, of Pringle Road, Rotherham, continued the fraud using the company details and accounts of a former £30,000 a year sandwich shop in York called The Pita (UK) Ltd. The gang leader also employed his uncles, Ibrahim and Huseyin Mayil, to set up a new business called Rotherham Cash & Carry Ltd at Hellaby, to take deliveries and sell the illegal goods once they arrived in the UK. HMRC officers raided Rotherham Cash & Carry, in November 2013. At the same time, German authorities closed down the bonded warehouse after the company was found to be operating illegally. 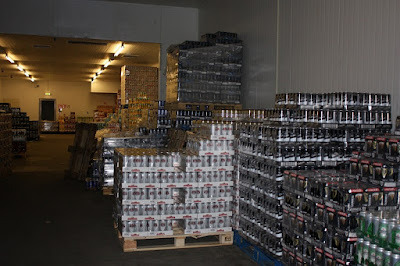 They seized more than 425,000 litres of smuggled beer, worth £575,706 in duty, and £68,000 cash from various businesses premises. Kaplan was arrested in November 2013 and £43,000 cash as well as receipts for the purchase of more than £215,000 of alcohol were seized from his vehicle. A further £5,000 was seized from his former home address in Wood Green, London. When Huseyin Mayil was arrested, officers seized £20,000 from him. His brother was arrested in January 2015. The four men were sentenced for conspiring to cheat the public revenue at Leeds Crown Court last week. Proceedings are underway to recover any profit made from these crimes. Stuart Taylor, assistant director, fraud investigation Service at HMRC, said: "This was a sophisticated and shameful attack on the UK's alcohol trade that undoubtedly harmed legitimate and hardworking businesses. Zerze and his criminal gang stole millions of pounds which should have been used to fund our public services and now they are paying the price behind bars."